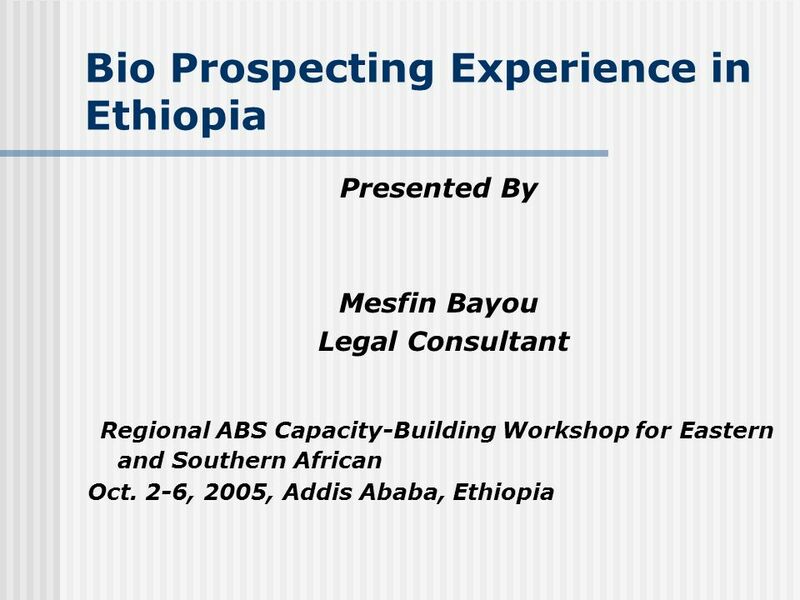 Bio Prospecting Experience in Ethiopia Presented By Mesfin Bayou Legal Consultant Regional ABS Capacity-Building Workshop for Eastern and Southern African. 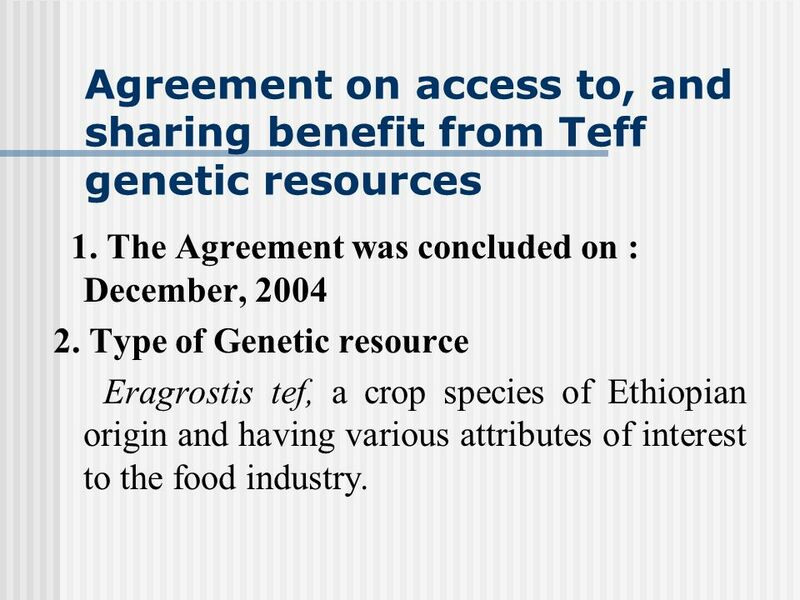 2 Agreement on access to, and sharing benefit from Teff genetic resources 1. The Agreement was concluded on : December, 2004 2. Type of Genetic resource Eragrostis tef, a crop species of Ethiopian origin and having various attributes of interest to the food industry. 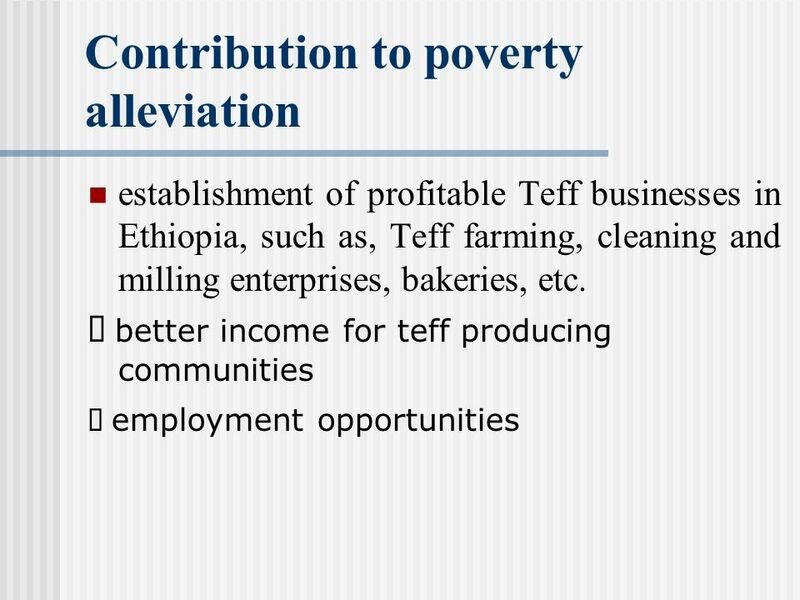 6 Benefit sharing annually royalty of 30% of the net profit from sale of teff seeds 5% royalty on the net profit from teff products, which shall not be less than 20,000 Euro per year, to the Financial Resource Support for Teff development (improving the living conditions of local farming communities and developing Teff business in Ethiopia) share research results, knowledge or technologies, except undisclosed information involving Ethiopian scientists (EARO) in teff research Soliciting funding that will augment Teff fund contribution to national economy (establish profitable Teff businesses in Ethiopia, such as, Teff farming, cleaning and milling,bakeries, etc. 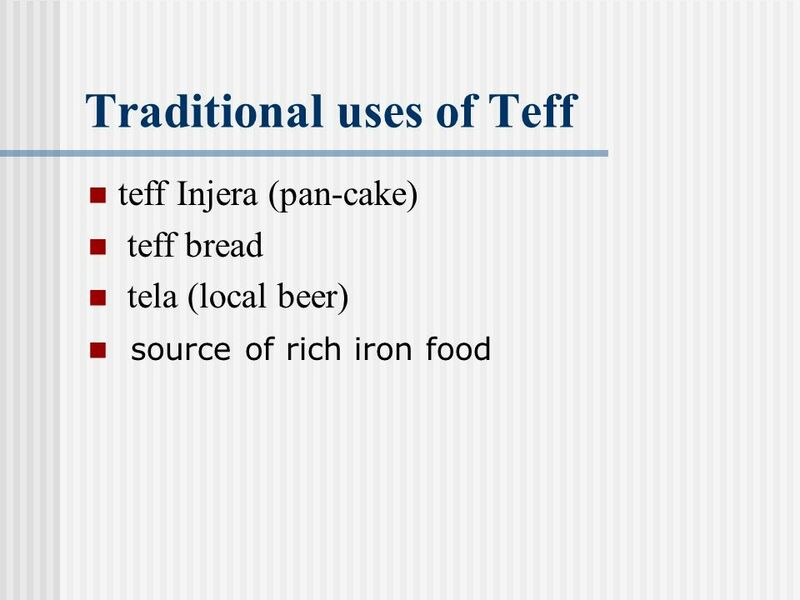 through joint ventures with Ethiopian counterparts) acknowledging Ethiopia as the source of Teff. 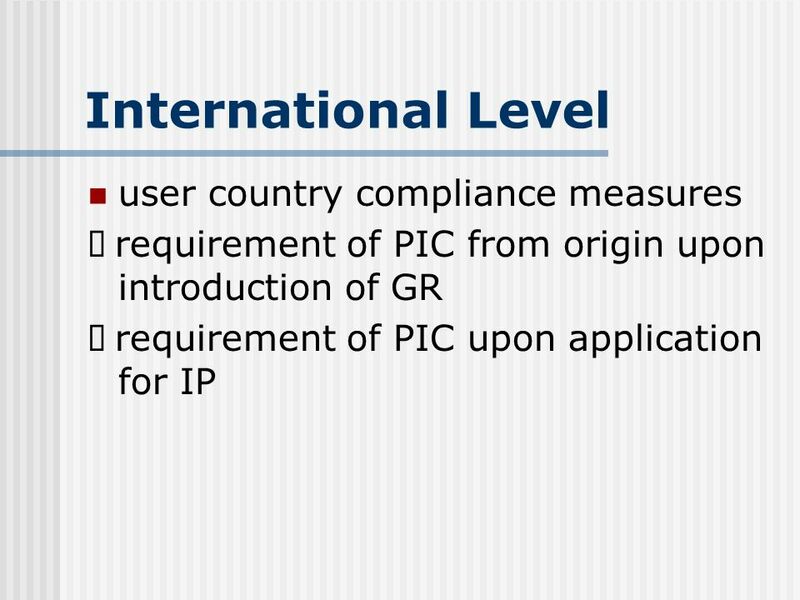 Download ppt "Bio Prospecting Experience in Ethiopia Presented By Mesfin Bayou Legal Consultant Regional ABS Capacity-Building Workshop for Eastern and Southern African." APROACHES TO ABS AND TRADITIONAL KNOWLEDGE ROLE OF THE AU(OAU) MODEL LAW by Prof. J.A.Ekpere Tel Mobile: 234. Regional ABS Capacity- Building Workshop for Eastern and Southern Africa, Addis Ababa October 2 nd -6 th, 2005 Coco de Mer bioprospecting in Seychelles. 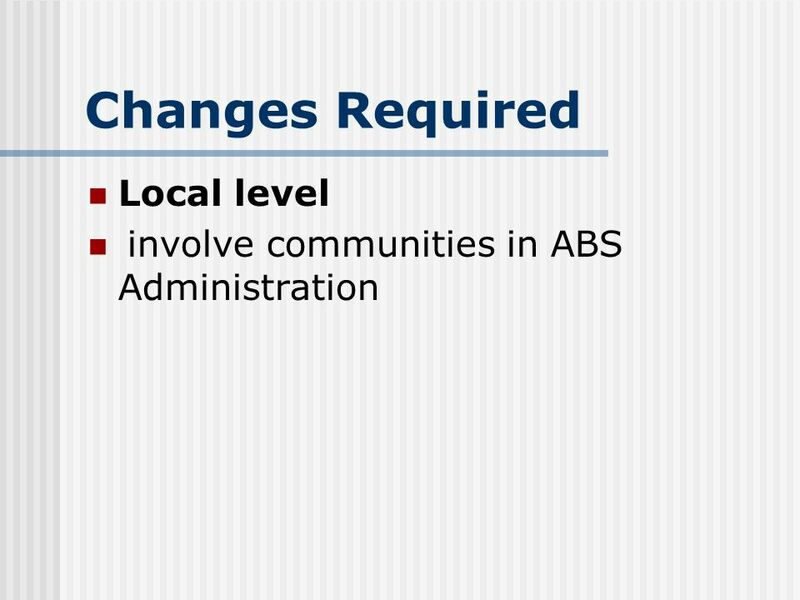 REGIONAL ABS CAPACITY BUILDING WORKSHOP FOR EASTERN AND SOUTHERN AFRICA ZAMBIA PRESENTATION BY LOVEMORE SIMWANDA AND RICHARD M. LUNGU. Regional ABS Capacity- Building Workshop for Eastern and Southern Africa, Addis Ababa October 2 nd -6 th, 2005 Commercialisation of alkaliphilic bacteria. BIO-PROSPECTING PRUNUS AFRICANA IN UGANDA By David L.N. Hafashimana (Ph.D) National Forestry Resources Research Institute (NaFORRI), UGANDA. Regional ABS Capacity- Building Workshop for Eastern and Southern Africa, Addis Ababa October 2 nd -6 th, 2005 Bioprospecting for enzymes in protected. 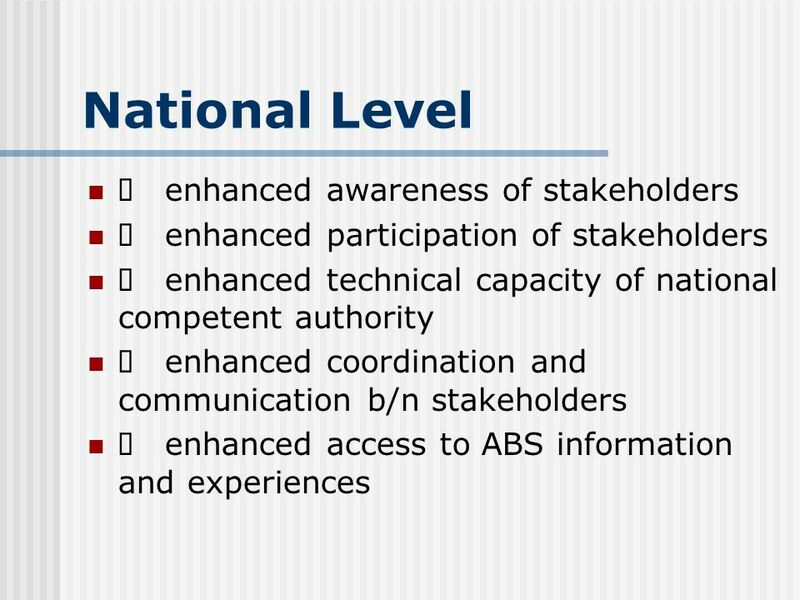 The Dutch-German ABS Capacity-Building Initiative for Africa Initial Workshop At the Kirstenbosh National Botanical Garden Cape Town, South Africa November. 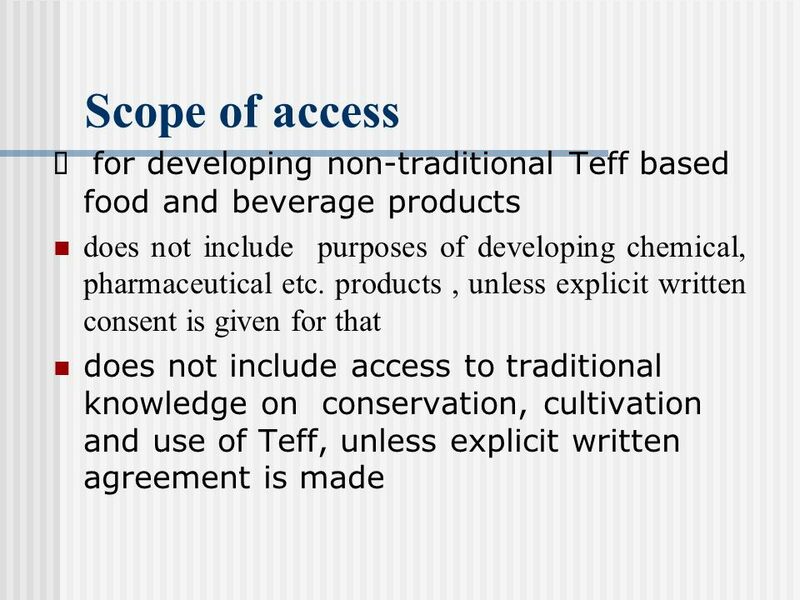 Agreement on Access to, and Benefit-sharing from, Teff genetic resources Institute of Biodiversity Conservation. 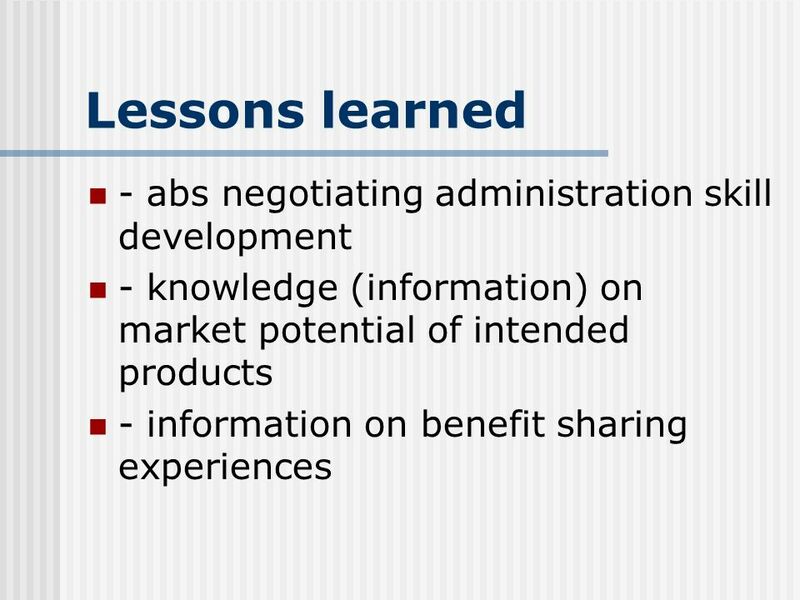 Agreement on Access to, and Sharing Benefit from, Vernonia galamensis L. Institute of Biodiversity Conservation June 2007. 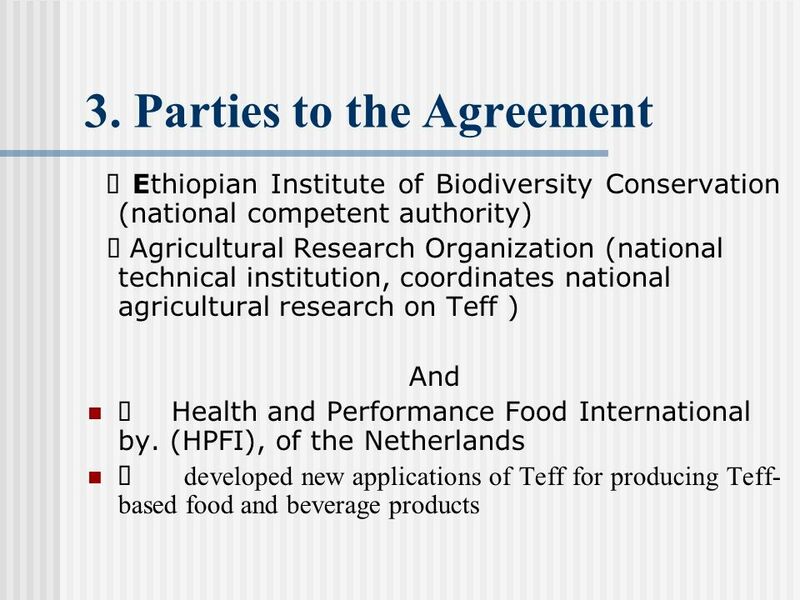 Agreement on Access to, and Benefit-sharing from, Teff genetic resources Gemedo Dalle (PhD) Institute of Biodiversity Conservation. PhytoTrade Africas Approach to ABS First ABS Capacity Building Workshop for Africa Cape Town, 19 th to 24 th November 2006. DEVELOPMENT OF AN INNOVATION CENTER WIPO/INN/MCT/04/3 WIPO NATIONAL WORKSHOP ON INNOVATION SUPPORT SERVICES AND THEIR MANAGEMENT Muscat, April 20, 2004. PRESENTATION TO THE SELECT COMMITTEE ON LAND AND ENVIRONMENTAL AFFAIRS TOWARDS THE RATIFICATION OF THE NAGOYA PROTOCOL ON ACCESS AND BENEFIT SHARING 13.